TL;DR: We made something cool and open, companies are interested in commercializing it (which is great! ), what do we do? Maslow is a large CNC router which lets you download and build big things. 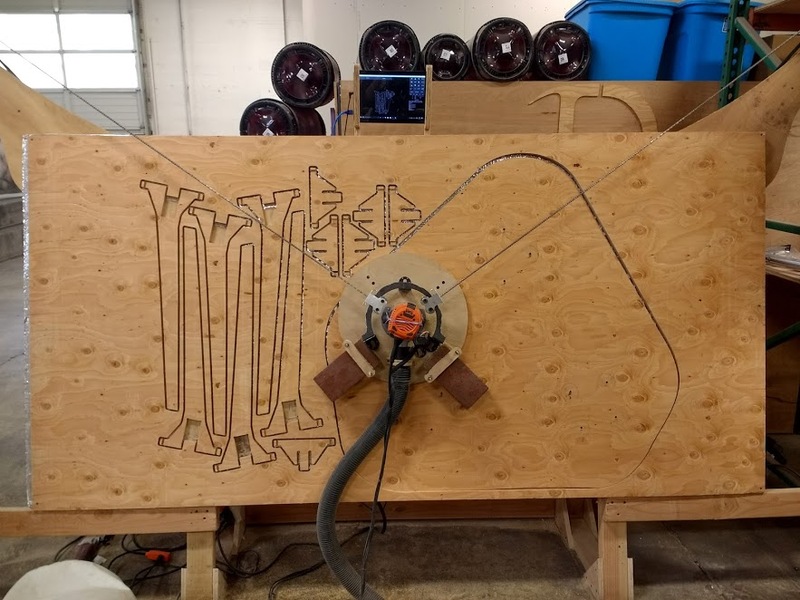 CNC routers have been around for a decade but Maslow uses a unique design to reduce the cost by a factor of 10 or more (with some sacrifices). Since day one of the project our only goal has been to make CNC technology accessible to more folks, and we’re succeeding. The obvious next step is a ‘consumer’ version of the machine which could be cheaper, easier to use, and probably more accurate. We (Hannah and I) are not the right people to make a consumer friendly machine, but several companies have reached out to say that they are interested in commercializing our idea. We want to reach out to our community to let everyone know that we are willing to help any company interested in the idea, and ask for advice from the community about how we should navigate this. We also want to try to reach beyond our core community to ask if any other projects have experience with this sort of thing. Are there better and worse ways to have someone commercialize our idea? What options do we have? We are not selling or licensing anything and we are willing to talk to anyone. Everything we’ve worked on is open (either GPL / public domain). We would love to see companies keep that open mentality when adopting our idea, but we realize that isn’t likely. We are happy to talk to any company regardless of what their plans for the idea are. We’re being open about providing advice and suggestions for how to make the machine more consumer friendly. Is this what we should be doing? Move all of the electronics to the sled. That way the entire machine can ship assembled in a single box. Switch from chain to a low stretch kevlar or some similar material cable. Wind the extra cable around a reel which will be imprecise, but use pinch rollers to track the exact length. Magnets embedded in one of the rollers coupled with something like the AMS family of encoders would make a precise solution. Use four cables, one in each corner. The force of gravity is the limiting factor on how fast we can cut and four cables would let us push the feed rate up a lot and increase accuracy. Calibrate by pulling each combination of two cables tight successively which will give the lengths of all four sides and diagonals which will fully define the machine’s position and require no user input. Keep the triangular kinematics system. It seems silly to have a hardware solution to a math problem, but the math is very non-linear and ugly. What more can we be doing, and what do we have the power to do?